Vero’s beginnings are rooted deep in ancient history. The first indications that people visited the area thousands of years ago were discovered when human bones were uncovered in 1915 and 1916. And from 2014 to 2017, four archaeological excavations further explored this presence and the importance of the Old Vero Site. When did these people first arrive? This question, like Vero Beach, is 100 years old. At the peak of the last Ice Age 20,000 years ago, a 2-mile-high glacier covered the continent 1,000 miles to the north. Vero was almost 400 feet above sea level then, compared with 20 feet today, and the ocean’s shore was 30 miles to the east of its current location. The area was a grassy plain with few trees and sparse water. However, a wetland existed that attracted Ice Age megafauna that roamed the land — mammoths, mastodons, sabre tooth cats, huge sloths and giant armadillos. By 6,000 years ago, the glacier had melted and the sea level rose, creating the Indian River and today’s shoreline. In 1914, pioneer developer Herman Zeuch had the Main Canal dug, which became part of a drainage system, to keep much of Vero from being a marshland. Cutting through the ancient wetland, the canal exposed bones of Ice Age mammals. In 1915, farmer Frank Ayers made a startling discovery — human bones — while walking along the canal. The spot, just behind today’s County Administration Complex, would become known as the Old Vero Site. At the time, Florida State geologist Elias Sellards was aware of the Ice Age mammal bones at Vero, but mammal finds were becoming common in Florida. What got his attention were the human bones. 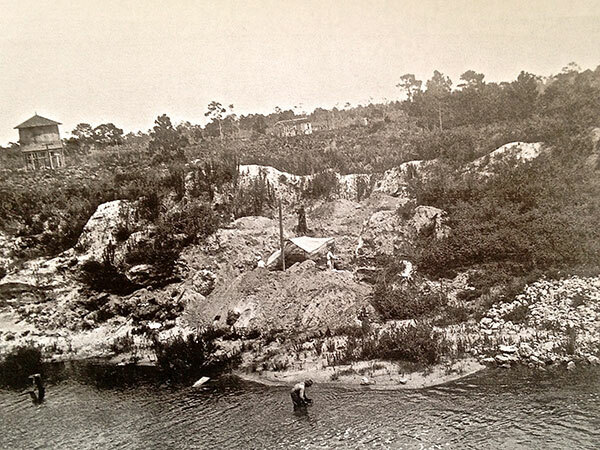 In 1916, Sellards came to Vero to excavate the site. He found the remains of another human, including pieces of its skull, which was named Vero Man. Sellards further uncovered separate pieces of bone and teeth that brought to five the number of humans found. Sellards also unearthed the bones of 23 types of mammals that went extinct at the end of the Ice Age, 11,500 years ago. This was an amazing collection of mammals compared to other North American archaeological sites. Because Sellards found human remains in the same soil layer and in association with these mammals, he concluded that humans inhabited the land at the same time. This challenged conventional wisdom that humans were in North America no more than 6,000 years ago. Today, the conventional view is that the first humans arrived in North America at least 16,000 years ago. Vero gained fame the world over for Sellards’ discoveries. In the more exaggerated newspaper reports the site was dubbed the Garden of Eden; Adam and Eve had been found. Sellards invited the top archaeologists and geologists of the time to Vero to inspect his findings. Among them was Ales Hrdlicka of the Smithsonian Institution, who was a proponent of the well-established opinion that people had not arrived in the Americas prior to 6,000 years ago. To dispute him was considered heresy. After his inspection at Vero, Hrdlicka declared that Sellards was wrong and the human remains were not from the Ice Age, but the result of ancient Indian burials years later. The importance of Vero quickly diminished. Within a couple of years, Sellards moved to Texas. But soon Hrdlicka’s theory of when people came to the Americas was refuted in the 1920s at Clovis, New Mexico, where a projectile point was found with the bones of Ice Age bisons. Clovis people had inhabited a broad part of the United States as far back as 12,000 years ago. The development of radiocarbon dating scientifically proved that the Clovis people were indeed present at the end of the Ice Age. Could Sellards have been right about Vero? In 1945, an archaeologist at the Smithsonian inspected the skull of Vero Man and discovered that it was a woman. The Old Vero Man name was no longer appropriate. Then the skull disappeared with no explanation. In 2006, the city planned another water treatment plant along the Main Canal. The construction required an archaeological review. Archaeologist Barbara Purdy came from the University of Florida and pointed out to those that had forgotten, that this is the Old Vero Site. She became an active promoter of re-excavating the site. Meanwhile, James Kennedy, who had dug in the area since he was a teenager, found a fossil bone which was displayed at the Vero Beach Museum of Art. On it was an etching of a mammoth — trunk, tusks and all. 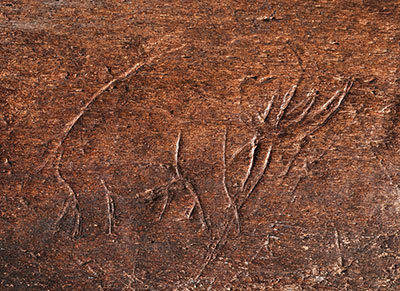 If real, it could be one of the earliest pieces of art in North America. A scientific evaluation at the University of Florida concluded, with a Smithsonian agreement, that it was probably real. However, Kennedy sold the bone, but to whom and where it is remains unknown, so it is lost to further scientific scrutiny. Although the Kennedy bone is unavailable, it revived interest in the Old Vero Site. In 2010, the Old Vero Ice Age Sites Committee was formed by local citizens to reinvestigate the site. Susan Grandpierre was the founding chairman; later former city Councilman Randy Old became chairman. In 2012, the committee hired Andy Hemmings, a Florida archaeologist, who began a study of the site. 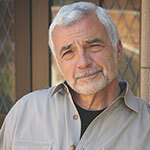 In 2013, James Adovasio, a renowned archaeologist at Mercyhurst University in Pennsylvania, became the principal investigator to direct an excavation. He is well known for his exploration at Meadowcroft, a site near Pittsburgh that helped establish the existence of man in North America pre Clovis, 16,000 years ago. Mercyhurst and the committee agreed to share costs and the excavation began in January 2014. 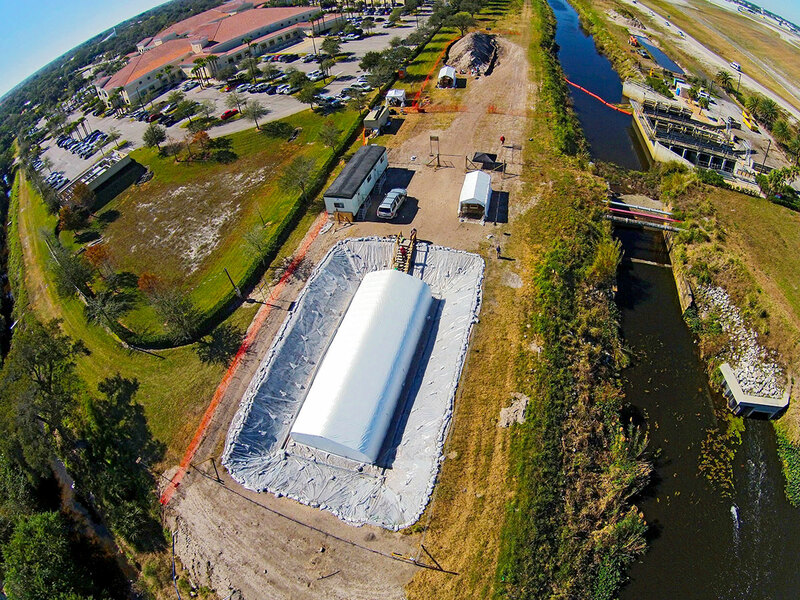 The Vero site is on Indian River Farms Water Control District land. Excavation was limited to January through May. It then was covered up during the rainy season so as not to impact the Main Canal if flooded. After removing 8 feet of overburden by the canal to get to the 1916 surface, a 60-by-20-foot weatherport was put in place. Within that area, a crew of 10 archaeology graduates began the meticulous excavation under the supervision of Adovasio and Hemmings. Using small trowels, they worked inch by inch through the soil layers. The soil was then sifted through screens to detect minute items. Volunteers screened parts of the nearby overburden pile, jokingly referred to as Mount Vero. 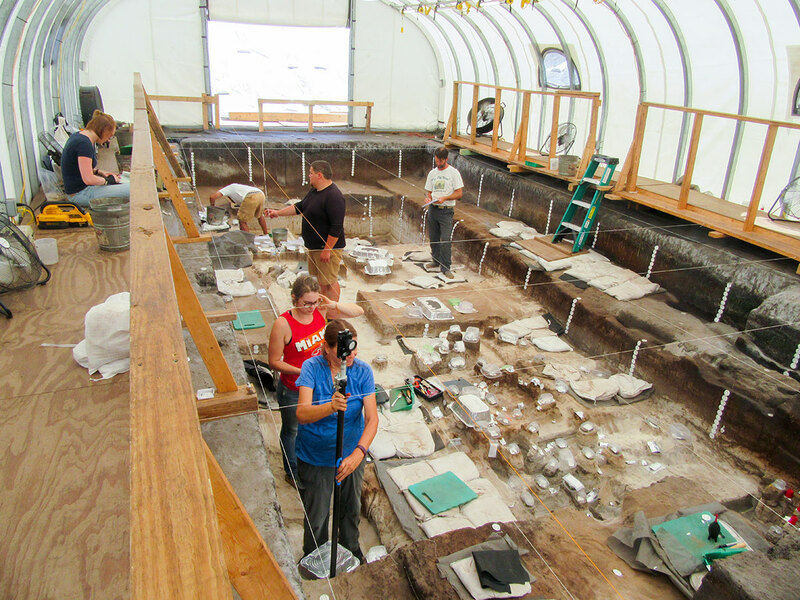 After the 2015 dig, Mercyhurst decided it could no longer afford to participate. The committee applied for and received state grants and with matching funds from local donations and in-kind volunteer labor the excavation continued. Florida Atlantic University’s Harbor Branch Oceanographic Institute administered the grants and provided housing for the dig crew. The excavation went to a depth of 12 feet below normal ground level, while encompassing nine soil layers going back 30,000 years. Indications of a human presence were found such as the stone flakes from the sharpening of stone tools. This material is not natural to the Vero area and had to be carried by humans from more than 100 miles away. Pieces of charcoal indicated a possible fire pit. An 8,000-year-old piece of woven material was uncovered. The presence of saltwater fish bones showed that humans might have fished on the then-distant coast. At the end of the 2016 dig, a bison bone bed appeared. Near it were bones of an extinct tapir with the tip of a man-made bone needle close by. Only post Ice Age projectile points were found. Volunteers made many similar finds in the overburden of Mount Vero, but in these disturbed soils the items had no context. At the annual conference of the American Society of Archaeologists in Washington in April, Adovasio reported the results from the four-year excavation. Using state of the art methods and protocols, environmental, geological, and archaeological material and knowledge were collected that defined the site far more than was possible 100 years ago. A total of 195 species of animals and plants have been documented. The tapir with the bone needlepoint is an indication, but not proof, of an Ice Age presence. The projectile points of a more recent time showed that people had been on the site 6,000 to 8,000 years ago. Furthermore, the piece of textile weave found was similar to the material in which skeletons were buried at Windover Bog near Titusville at a similar time. This indicated burials at Vero as well. 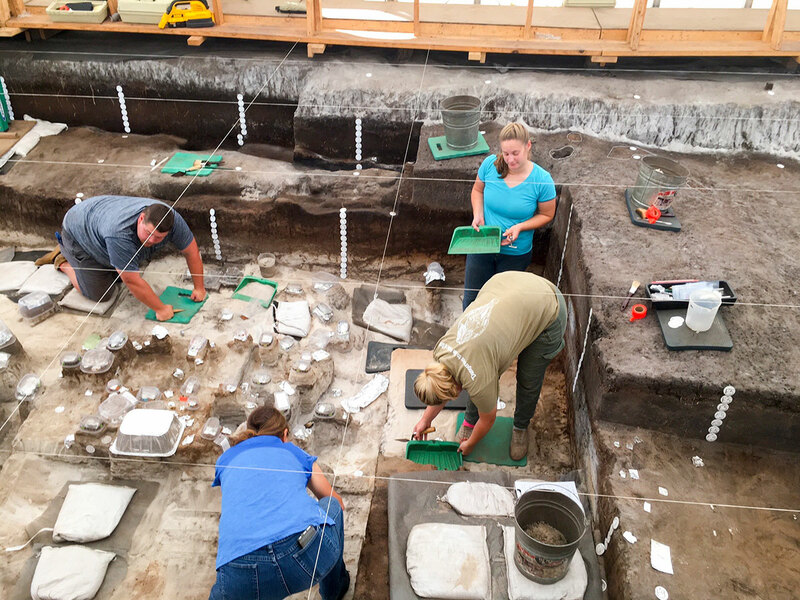 While there were no Ice Age artifacts found at the site, the discovery of a 12,000-year-old Clovis projectile point in a ditch on the Hornbuckle farm 3 miles away showed that humans were indeed present in the Vero area at that time. The dig was completed in May 2017. During the excavations, almost 2,000 people toured the site and articles describing the project were published in newspapers and journals nationwide. More than 100 radiocarbon dates were taken. Analysis of the findings is continuing. More remains to be learned about the Vero site. Exploratory corings have identified a promising location for a future dig. For the local community and Vero’s many visitors, the nucleus of a future museum-quality exhibit that depicts the importance of the history and recent excavation of the Old Vero Site has been installed by the committee in Indian River State College’s Brackett Library. Sources: An Ice Age Mystery, University Press of Florida, 2017, by Rody Johnson; Preliminary Assessment of Recent Research at the Old Vero Site, J.M. Adovasio, et al., presented at the Annual Meeting of the Society of American Archaeology, Washington, D.C., April 2018.